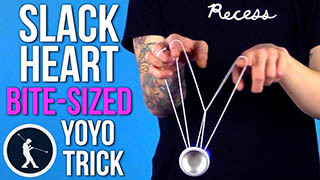 Learn how to do the Slack Heart Mount Yoyo Trick – a Bite-Sized tutorial. Slack Heart Mount Yoyo TrickThis is the Slack Heart Mount. It looks like this. To start off, we are going to do a One and a Half Mount, or what looks like a One and a Half Mount. Instead of landing in the One and a Half Mount, we are just going to leave our fingers positioned, like so. You are going to use your bottom three fingers on your throw hand to pull the string back so that way you have access to both strings in your One and a Half Mount. For the next step, you are going to swing the yoyo up and behind your One and a Half Mount landing on this bottom string, right there. 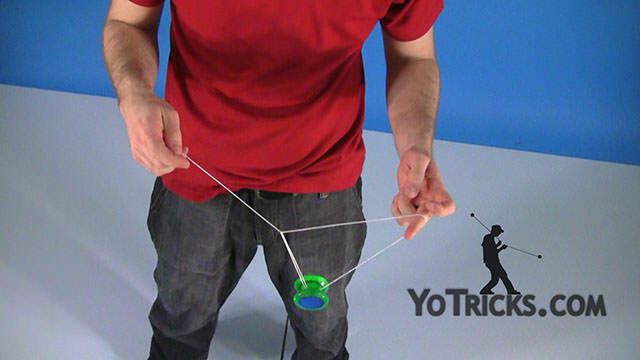 Once you have your yoyo mounted on the bottom string, you are going to take your non-throw hand and push it above the yoyo. 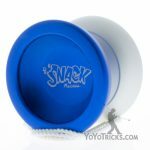 You are going to roll your yoyo over top, into this front string right here that is draping down from your throw hand, it looks like this. You are going to roll it over, landing it on that string, and if you see now, there are two strings that are over top of my non-throw hand index finger. What I am going to do is just gently pinch it in. Not too much, because then both strings will fall off. You just want this front string to fall off so that the yoyo lands into this Green Triangle. This is the same Green Triangle from And Whut, which we also teach on our channel, so go back and check that out if it interests you. Once you are in your Green Triangle, you are going to gently lift your non-throw hand up. 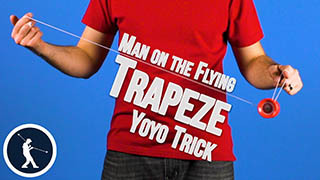 As you see, that is going to move the segment of string connected to the yoyo closer to my throw-hand. 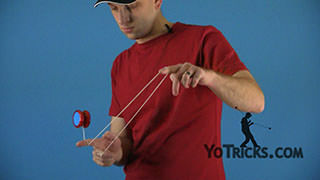 Once that segment of string is touching your throw-hand index finger you are going to pinch with your throw-hand thumb. This is the point where you really have to pay attention to where you are dropping your slack. You need to make sure that your slack goes directly into the yoyo. 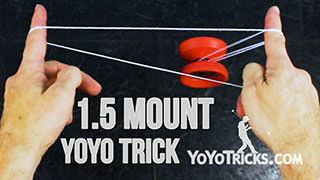 If it goes behind the yoyo or to the side, it is not going to form the Heart Mount that you want. 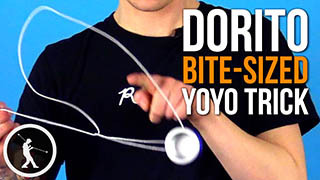 You need to make sure that, as soon as you have that string pinched, you need to turn to the side and then look at where your throw-hand is aiming to make sure that the string lands directly into the center of the yoyo, like so. Once your throw-hand is pinched, and you are looking down the gap of your yoyo where your slack is going to drop, as soon as this string is touching the gap of your yoyo you are going to release your pinch and spread your throw-hand fingers forming the Heart Mount. You are going to take your non-throw hand, put it in this side of your two triangles, with your throw hand staying this side. This is where your true triangle is. This is where, if you were to drop this whole thing, this is the side that would create the knot. What we want to do is hop the yoyo out of this side, and we need to exit from the back of the mount, which looks like this. 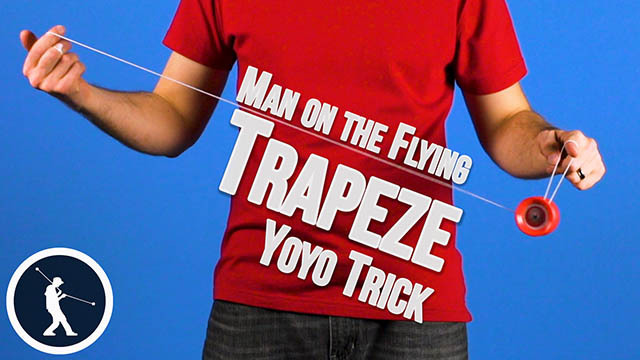 When you hop out you are going to land on this front string, which lands you into a weird Trapeze and His Brother Mount, and then you are going to, again, lift your throw hand up, dropping it into a Trapeze, and bringing it back to your hand. That was the Slack Heart Mount.